Price includes postage within the U.K. Shipping to U.S.A. or Western Europe included. 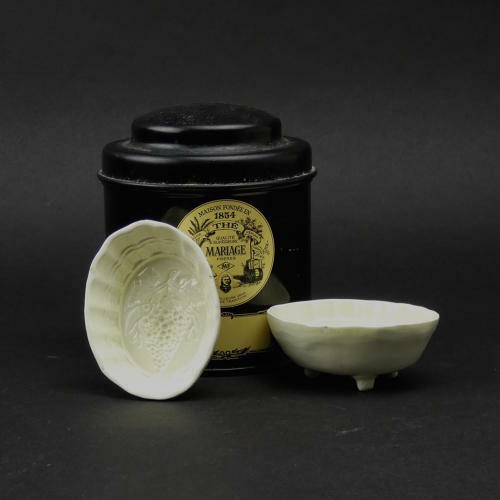 A very fine pair of miniature, 18th century, creamware moulds. These are amongst the smallest pottery moulds that we have ever had. They are extremely finely potted in creamware, they stand on three small, peg feet and they date from c.1780. In the base of each mould is a very well detailed bunch of grapes and the sides have a simple, ridged border. Amazingly they are also, both, in exceptional condition, particularly when you consider their age and the fact that they were made for use. The only faults are a couple of very tiny glaze flakes to the rims.